The original idea for the class was to make a May Basket. Traditionally, a May basket is filled with flowers or treats and left anonymously on a neighbor's door. I don't know if many people do this anymore, but the ladies in the class knew the tradition. The basket is from the Easter 2010 seasonal Cricut cartridge. I cut it at 11 inches. This size will fit on the 12 x 12 mat but there is one little trick to make it work. The basket and handle are all one image (two pieces that add to the mat in one box). When the basket is this large, the handle extends just a bit into the "uncuttable zone" at the edge of the mat. To solve this problem and get as large a basket as possible, I made two pages in the file. In the first, I centered the basket on the mat and hid the handle and for the second, I centered the handle on the mat and hid the basket. 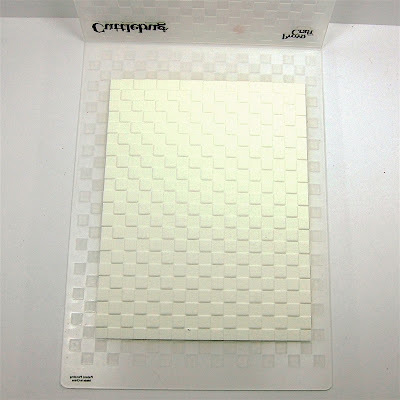 You just load the mat and cut one page and then the next page without unloading so you only need one piece of 12 x 12 cardstock for each basket. This basket is designed with small circular holes in the scallops. I have used this basket before and I wasn't happy with the way the circles cut. 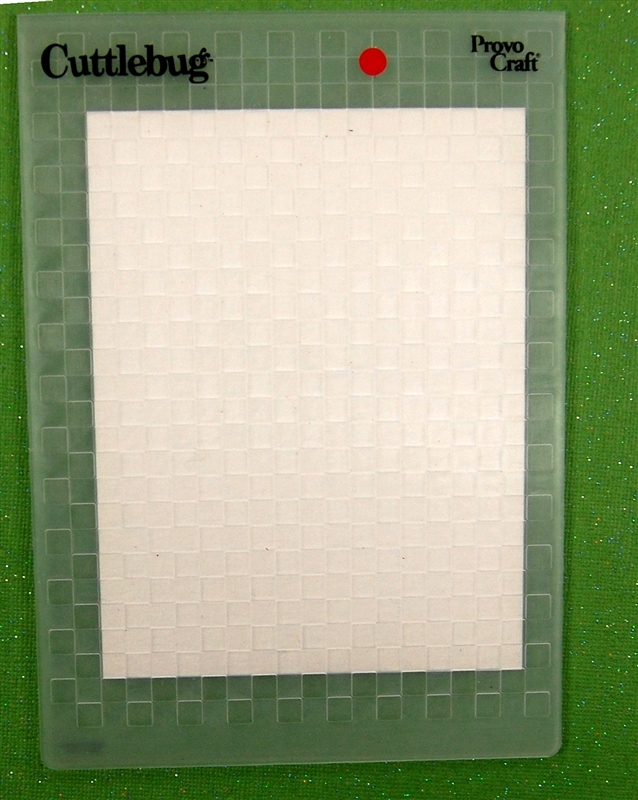 They tend to slant into an oval shape and were off center to the "bumps" of the edge design. 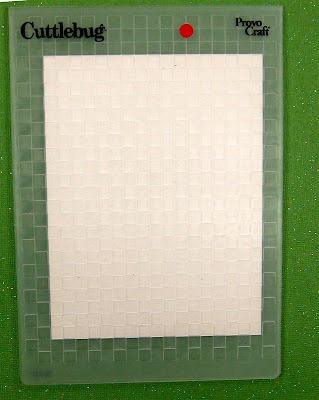 The simple solution was to hide the circles and just leave the decorative edge. I also hid all of the scoring "tick" marks. I think they make the folds looks very sloppy. 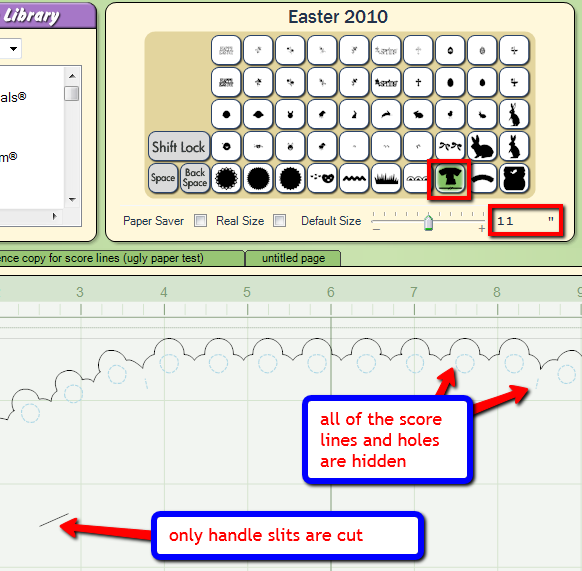 If I am not sure about the scoring, I will cut a sample with the marks in ugly paper and score it to use as a pattern. The only interior cut lines I kept were the two side slits for inserting the handle. If I wanted to delete all of the scoring marks, including the handle slits, I could have simply checked weld. I would still have to hide the little circles but this doesn't take very long. The baskets were much faster to cut without the circles, which was a help for making a larger quantity. I decided that it would be best to do the scoring at home. The angles are a little tricky and I wasn't sure it anyone would have used a scoring tool before. Since we had limited time to work, I also added pieces of Scor-Tape on the flaps for assembling the basket. The handle has a flower and leaf shape at the center but there are no layer cuts on the cartridge to add to the top. 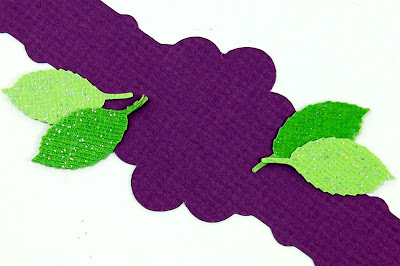 I used a Martha Stewart Rose Leaf punch to punch two light and two dark green leaves from glittered Core'dination cardstock (Core Couture). 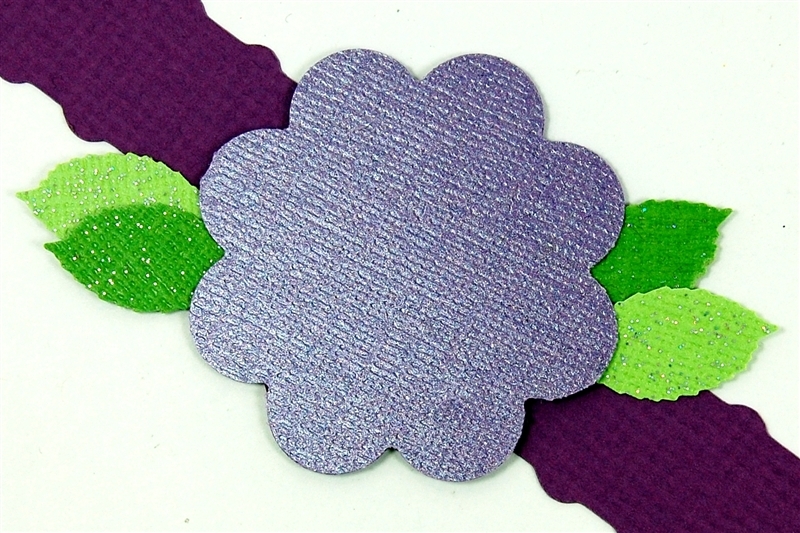 I also punched a scalloped circle from purple Core'dinations Gemstone cardstock with the Creative Memories scallop circle maker punch. One leaf of each color on each side fits nicely over the cut shape of the handle. 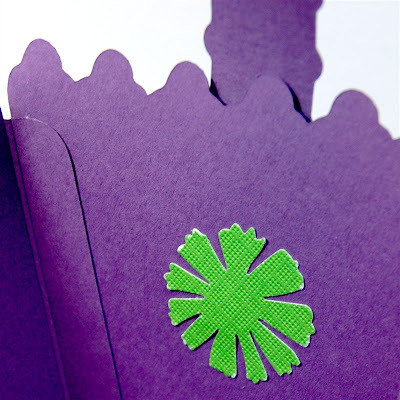 The scalloped circle covers the stems and the flower shape on the handle. 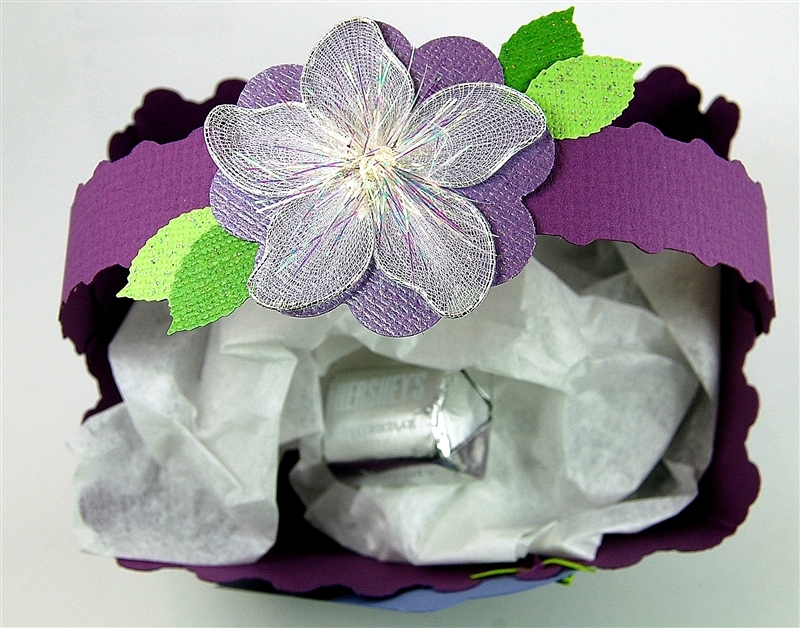 The white flared flower from Creative Charms adds a nice sparkle to the top of the basket. I was concerned the the handle might pull out easily if the basket was loaded with goodies, so we punched out hearts and flowers from adhesive cardstock to secure the ends on the inside of the basket. Some of the ladies chose to add the sticky shapes as reinforcement on the outside of the basket as well (this photo shows the Martha Stewart Cosmos punch shape on the inside). I gave them some crumpled tissue paper to fill the basket and a mini chocolate bar as a start on the goodies to go inside! 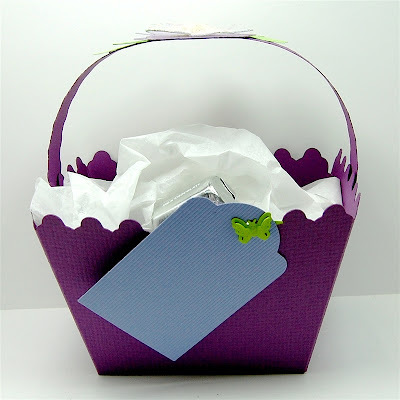 We also added tags punched with the Creative Memories Tag Maker and secured the tag to the basket with a small butterfly brad from Creative Charms. 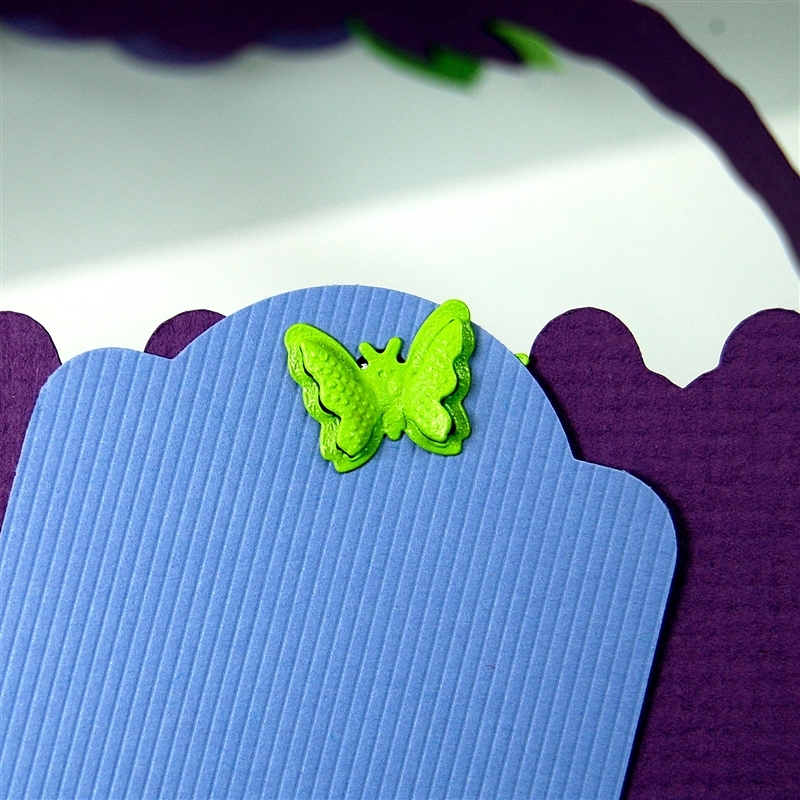 The sets that include these butterflies are on the inventory clearance sale now at Creative Charms. I knew that the baskets would be fairly quick to put together, especially since I did all of the scoring and taping ahead of time, so I decided we should also make a card. 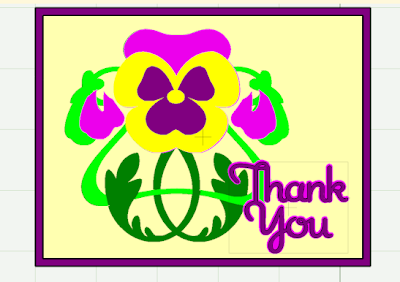 The pansy image I chose is from the Art Nouveau Cricut cartridge. The style of the flowers on this cartridge is so appealing to me. 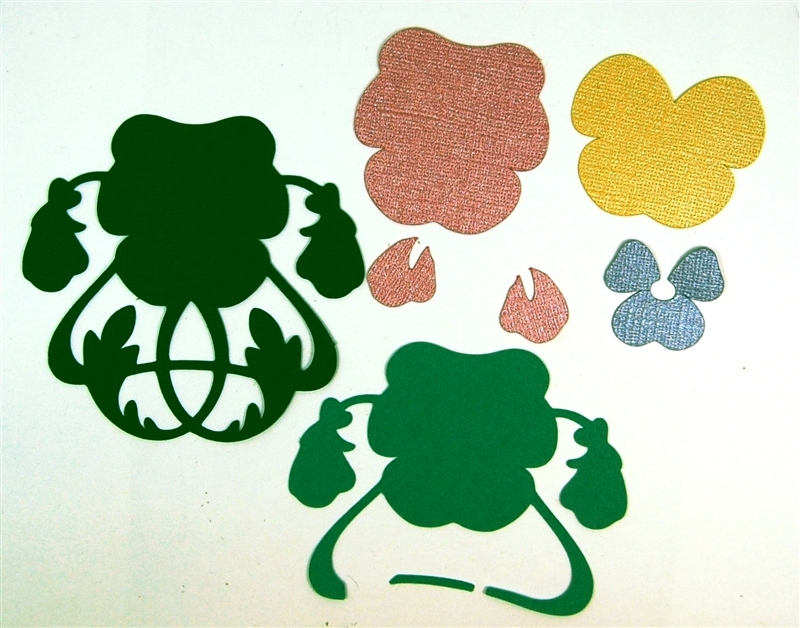 I made several of the flowers for part of the display for the center's gallery. 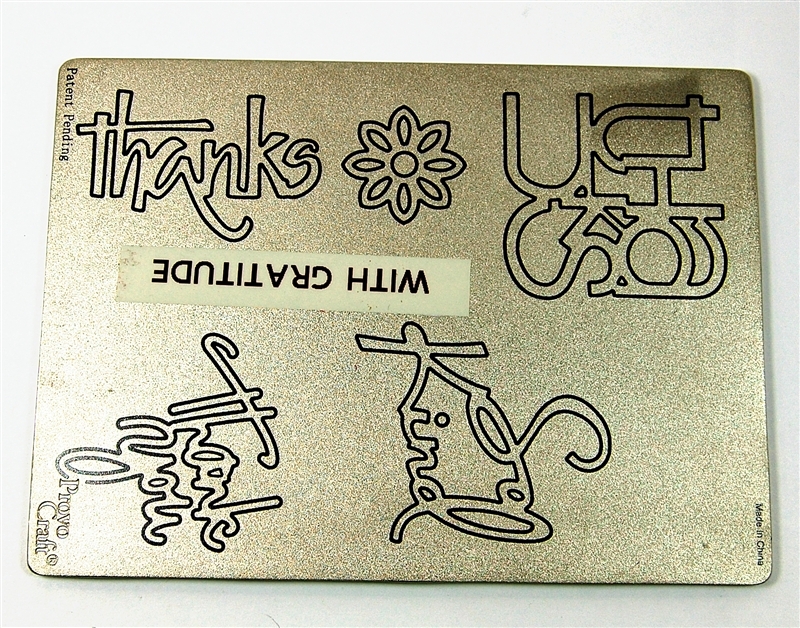 I decided to add the "thanks" sentiment as an option since most people can always use a thank you card. Here is the location of the image on the keypad. I cut all of the layers in groups to be more efficient for making up kits. I hid all of the guideline marks again. 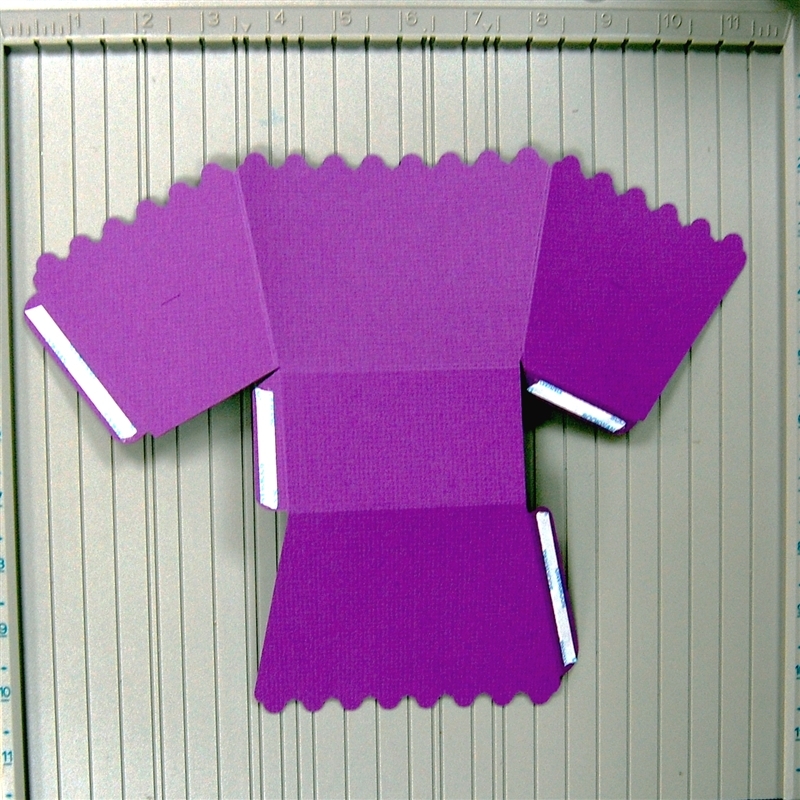 These shapes are very simple to assemble and If the lines show, they can look a little messy. It also made the cutting go more quickly. 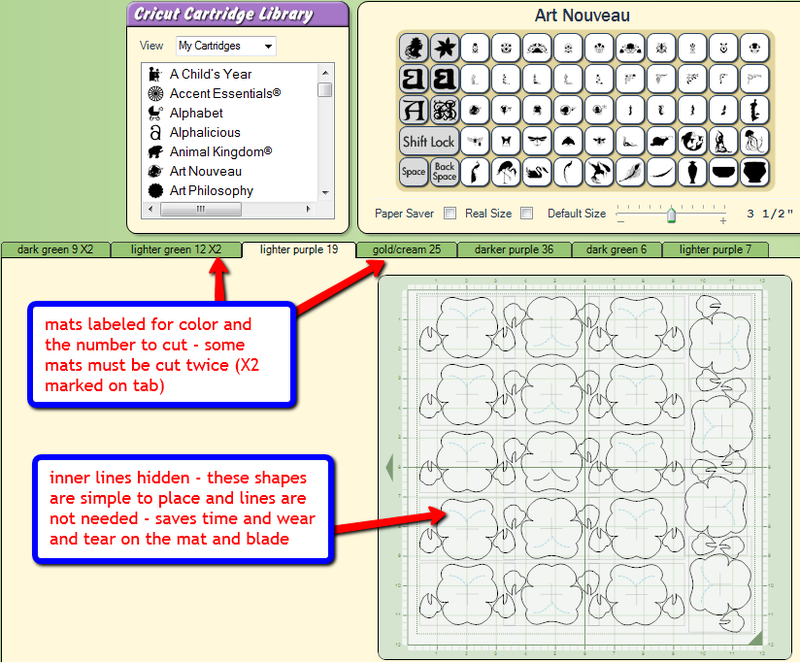 I arranged the shapes with Design Studio to fit as many as possible on the mat. I labeled all of the mats with the color, the number of images on the mat and, if the mat needed to be cut more than once, I added "X2" to remind me. I played around with the colors a little in another file. I lined up all of the layers and filled them with colors approximating the color I would use. 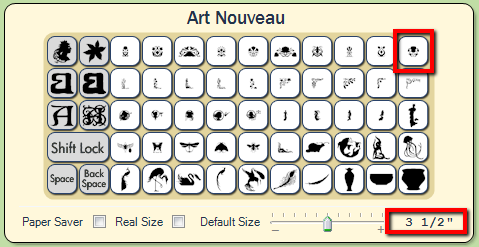 Since each mat will only preview in one color, you need to make quite a few pages in the file and move the images into position to get an approximation of the completed card. This "Thank You" is from the Martha Stewart Crafts All Occasions Cakes cartridge. In the end, I opted to use the Cuttlebug "With Gratitude" die to cut the sentiment. 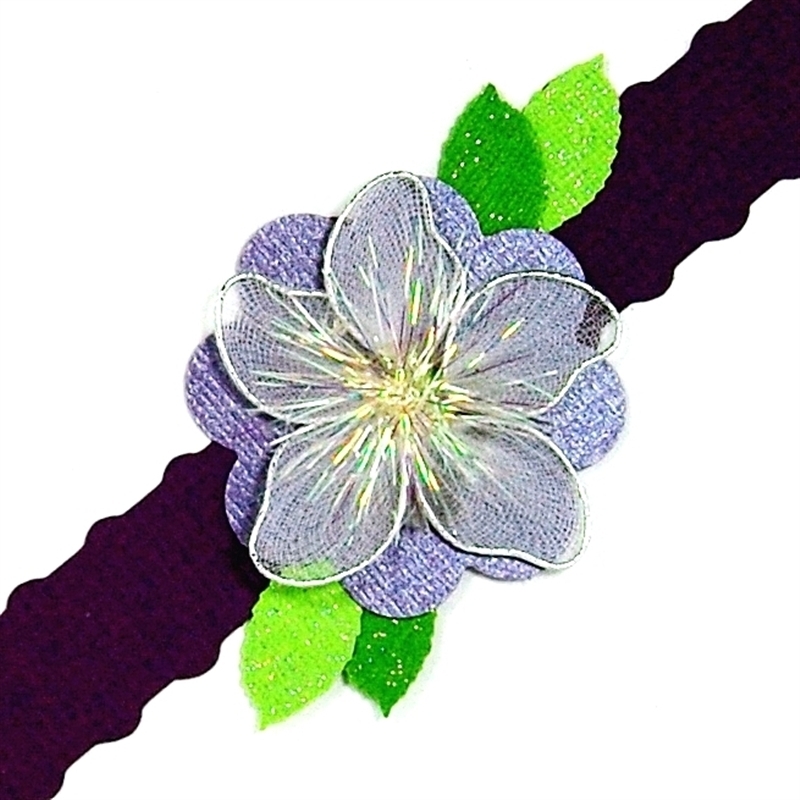 There are five layers for the pansies and they are easy to assemble (but you do have to watch out for the tiny lighter green strip that layers to create a woven effect for the stems). The background layer of the card is cut from heavy watercolor paper. This paper takes the embossing very nicely. I centered the piece of watercolor paper, cut at 5 1/4 x 4 inches, in this checkerboard embossing folder which creates a basket weave effect. 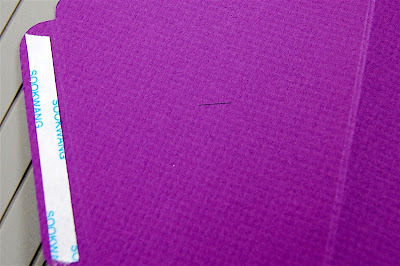 Since the folder is 5 x 7 it was easy to line up the design with my trimmed piece of cardstock to get an nearly perfect edge. A single gem sticker in the center of the flower finishes off the image. 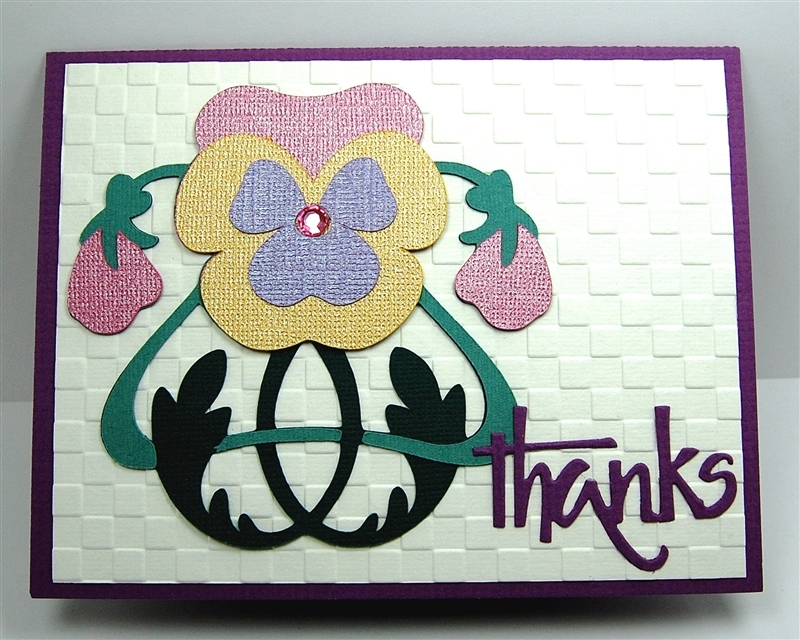 Some of the ladies chose to use this as a general note card and centered the flower shape on the card front. 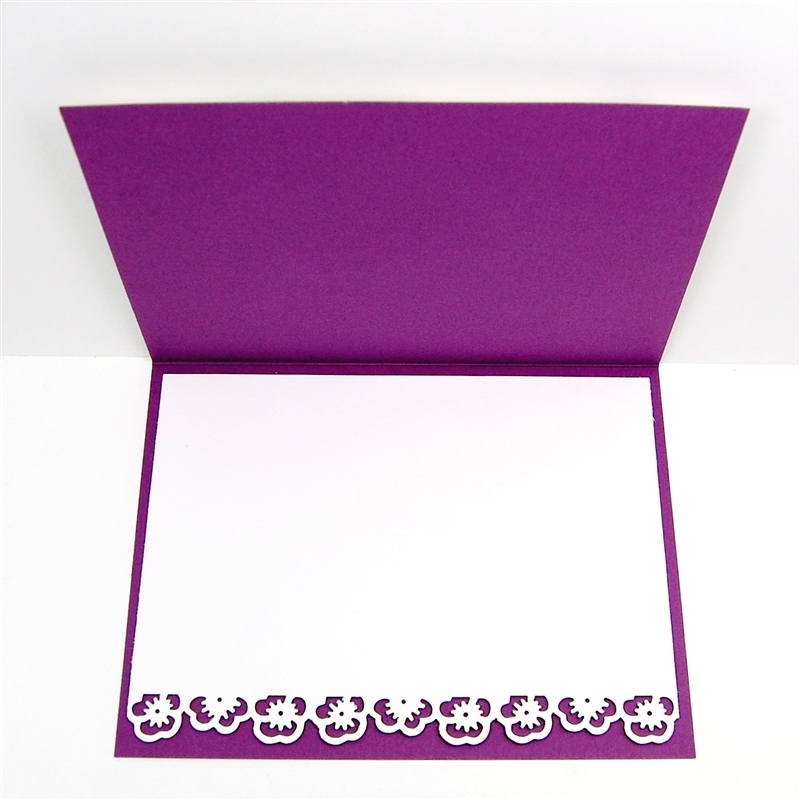 The card base is a deep purple Bazzill cardstock, so we needed a liner to be able to write legibly inside the card. 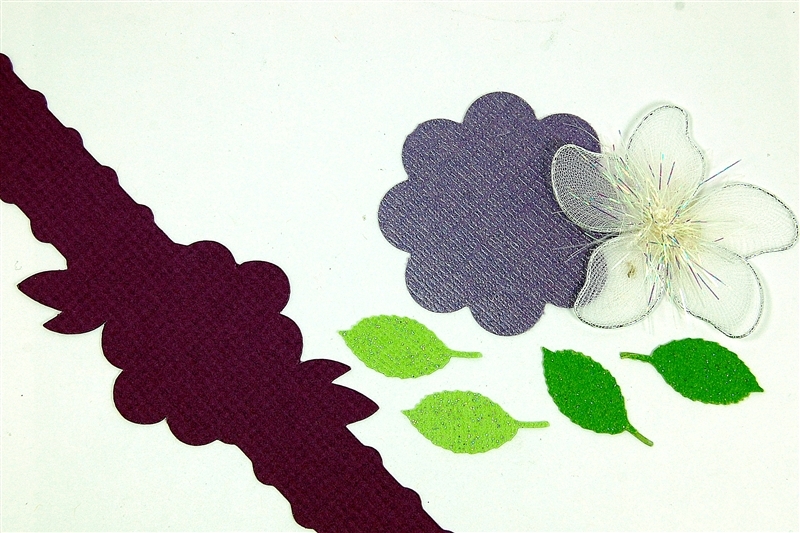 I cut some plain white cardstock to 5 1/4 x 4 inches and punched one long edge with the Martha Stewart Pansy Punch Around the Page border punch. I centered it carefully to make the pansies come out evenly. I made this quick digital page with the photos of the class. I'll drop off an 8 x 8 copy at the center for their bulletin board. I used Creative Memories StoryBook Creator 4.0 to make this page and I'll have more details about the page another day. Remember, the software is on sale for 35% off (making it only $42.22) until the end of April. 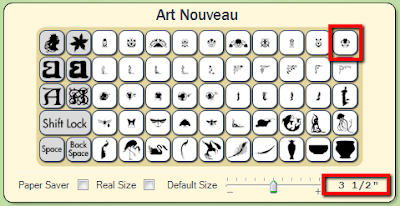 (You can click HERE to go to the page for the software on my Creative Memories site). There is also a three day sale on Mother's Day digital content for 30% off - this sale ends on Saturday the 21st. There are many items included - basically anything flowery or feminine! Here is a LINK to the sale page on my site. Some of the Creative Memories digital content is now available in universal format so you can use it with other programs - be sure to check the format in the description (most of the universal format items are at the end of the list). As the mother of two Eagle Scouts, I have learned over and over to "Be Prepared." I made sure to have plenty of kits for the class in case someone came unexpectedly or there was a piece missing or a part was damaged before the card was put together. If you have read this far - it must be a slow morning for you! 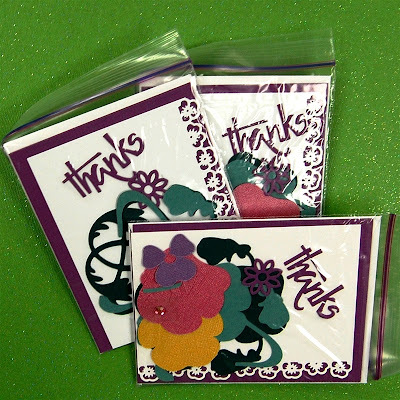 By now you know that I like the number three, and I have three complete card kits (just the card, not the basket) that I'd love to send to three readers. This card would be pretty for Mother's Day with the appropriate sentiment added. If you'd like to receive a kit, just leave a comment on this post. Please be sure to leave a way I can contact you if your name comes up in the random draw. I'll pick three names next Wednesday (a week after the class) and post them on Thursday. Please tell me in your comment a favorite crafting tip - a tool you love, a site that inspires you, a source of unique items to use for your projects, or a way that you organize your craft space. It's much more interesting to read tips than a series of "please pick me" posts and it will be helpful for other readers too! 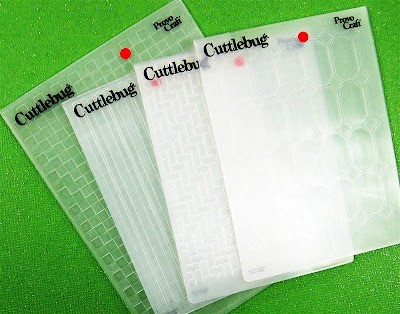 my cuttlebug is my right hand man...i love using ll sorts of dis and embossing folders with my "bug"...dont know what i'd do without it! Thanks for the tip about cutting the handle for the basket. This will be a great project to work on with the grandkids. My desk is my favorite tool! I have the IKEA galant L shaped desk, with plenty if room to work. On it I have my KNK Zing, Silhouette Came and lap top computer on the long part of the L.
On the short side of the L, I have my work area, and the "lazy susan" white unit from Michaels, that contains 2 ATG guns, one for acid free, that's the red one, the pink holds general purpose glue. I also store my scissors, tweezers, bone folder, and other necessary tools in that unit. Right in front of my work area, I have an orange desk organizer from target, where I keep all my markers, Copic and Sakura. Cords from lamps, cutting machines and computer are all tucked underneath the surface so they don't show. The desk is white. I have the non stick thin protection when I stamp or hot glue, it's similar to the oven protection you can buy at bed bath and beyond. Last but not least is the great desk chair I purchased. It is so comfortable. I Love my space! I forgot to leave my contact, it's Elisabeth dot bier at g mail dot com. That's the contact for the novel writer :), Gardendog. Hi Diane: First, I want to compliment you on such a fun way to recognize the class, by having the Storybook digi-page created for the group's bulletin board. What a nice idea, and it certainly helps promote your future classes there. And of course, your preparedness. SUPER nice kit for the attendees!! Now for my favorite tip/tool. Hmmm. I have SO MANY!!!! I think it's the way I store my Cricut cartridges -- books/overlays in alpha order in photo storage boxes, separated by file tabs that I cut using "From My Kitchen" cartridge, and then the cartridges themselves in a tool chest with tiny drawers, labeled of course, alphabetically. Each of the smaller drawers holds up to 4 cartridges. When I started, I only had 2 in each drawer. As I've added more cartridges, I can easily slip another or rearrange so the whole system doesn't have to be rearranged. Hard to explain here without a photo, but it works well for me. As always, thank you for the opportunity to win. I had to laugh about your comment about "if you've read this far you must be having a slow morning." No, just that I've figured out how to multi-task thanks to several computers (each with multiple windows open) going at one time, and a swivel desk chair, LOL!! saw your teachers side of you. Impressed. So nice to see the smiling faces. Good luck to all everyone. Yep, yours is usually the first email I read ieach morning. Since pansies are my favorite flowers, I am going to go on a mad hunt for that Martha pansy border punch. My favorite items are my Cricut, Cuttlebug along with my nestibilities, all my Border punches. Of forget it, I LOVE THEM ALL!!! Please keep posting detailed photos and instructions. I always look forward to your emails...they brighten my mornings! What a wonderful post. Love your tutorial. You make everything come to life. I think pansies are fast becoming my favorite flower. My favorite tool has to be the Cricut and also my tweezers. I use them for everything as my fingers don't co-operate sometime. I have so many favorite tools that I thought I'd share my latest "tip." 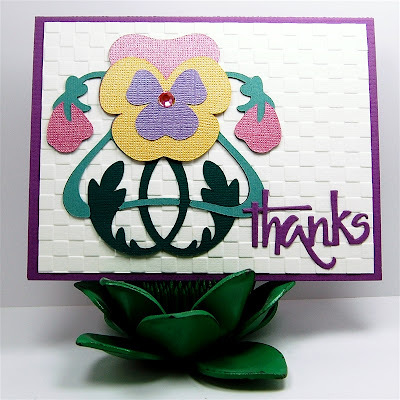 I have a hard time parting with all of the extra pieces/scraps from a project and so every once in awhile I will focus on using those up -- and have created some really great cards and pages with pieces that that never would have been used together otherwise! The corner rounder punch is probably my favorite tool right now. It always softens the look of whatever I'm making. The cuttlebug folder is called Checkerboard. (the other three in that set are: brickyard, pajama stripe, and window panes). Mine came in a boxed set with some sort of promotion when I bought my cuttlebug (HSN, QVC - can't remember) and were labeled on the outside of the box only. I am a long time follower and love your site. I look forward to the emails you send to get inspired. I get ALOT of inspiration from You Tube. There are so many wonderful projects there and I love seeing what people do. Thanks for the giveaway and I would LOVE to win one of those kits. Thanks. What fun projects to make. What classes are these? 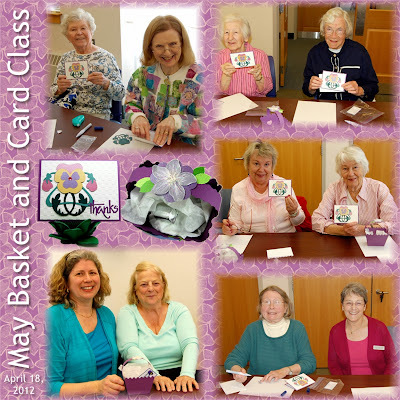 It made me think of classes to take to a Senior Living Home. My tip is using a Pampered Chef twirly kitchen utensil holder ( round) for my scrapping most used tools. It sits close by on my crafting table. I love your pictures, including the non crafting ones. My favorite tool would be my gypsy. I carry it everywhere I go. You never know when you might some extra time to do a little creating during the day. This card is beautiful. I would love one of the packs. Thanks so much fir sharing. I love all my tools! A favorite? I guess that would be my Spellbinders dies. I enjoy your posts and learn a lot as I go. As always Diane, your projects are beautiful. I really like that you adjust your designs to fit what you want and do it in such a neat way. 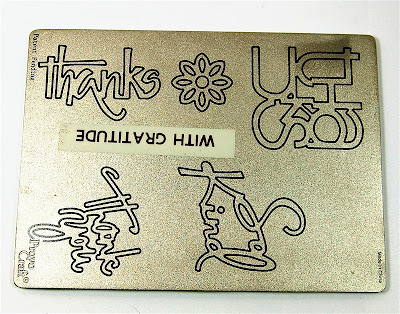 I was just catching up reading my mail, when I saw yesterday's post and was mesmerized by the embosing and the super clean cut for the sentiment, you got me wondering, where did she got that embossing folder? I have not seen it! Now I know... LOL! It is very kind of you to give us all the details,, sure it is nice to read a post quickly specially if you have little time to spend, but your posts Are always worth the time, their are full of interesting content. Indeed this cards would be a fabulous for Mother's day. Thank you for all you do and share with us. 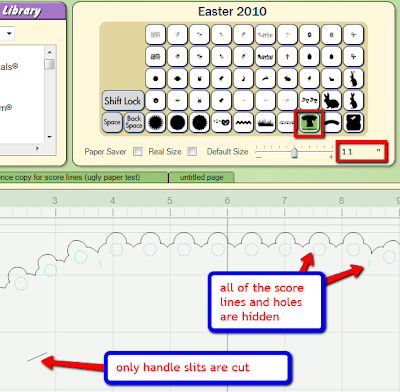 And of course I forgot to tell you about my favorite tool, well I have to say paper trimer and scoring tool. They make things easier. One of my favorite tools is the all-purpose tool by Creative Memories. 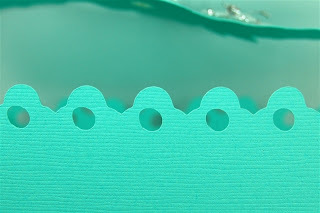 It is invaluable when picking up all sorts of small items, including small piece I've cut with the Cricut. 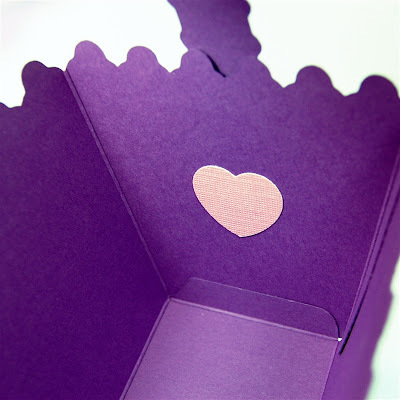 Love your blog--and I hope I win the card packet. Looks like fun was had by all those who attended! My favorite toys change. Some days, my Gypsy, Cricut, Score tools, Nesties, embossing tools and the list goes on. I also seem to go through colors too. I have my blue phase, then maybe red, blacks and white, all white, etc. One year instead of flowers for valentine's. I asked for a label maker instead, cheaper than flowers. It is the most wonderful thing to organize your stuff, I can read and reach for whatever I need. I use the boxes that cricut cartridges to store tons of things, stickles, glue, pens, wet chalk, you will be amazed at what you can fit, and they have magnetic closure so your stuff just stays in, then a label and I have organized a lot of stuff in a small space and recycled the boxes, for free. 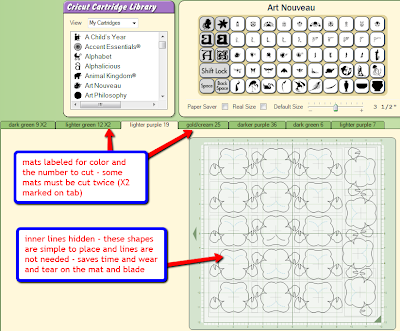 love my cricut, best scrapbooking tool on the market in my opinion. love all the scapbooking blogs for all the wonderful ideas out there. Flowers! I need to find that Pansy Border Punch, I Love ItI!! My Favorite things are my MS Score Pal & all of my MS Punches!! They are by far the best punches on the market!! Thanks for all the Wonderful Steps & Pics!! 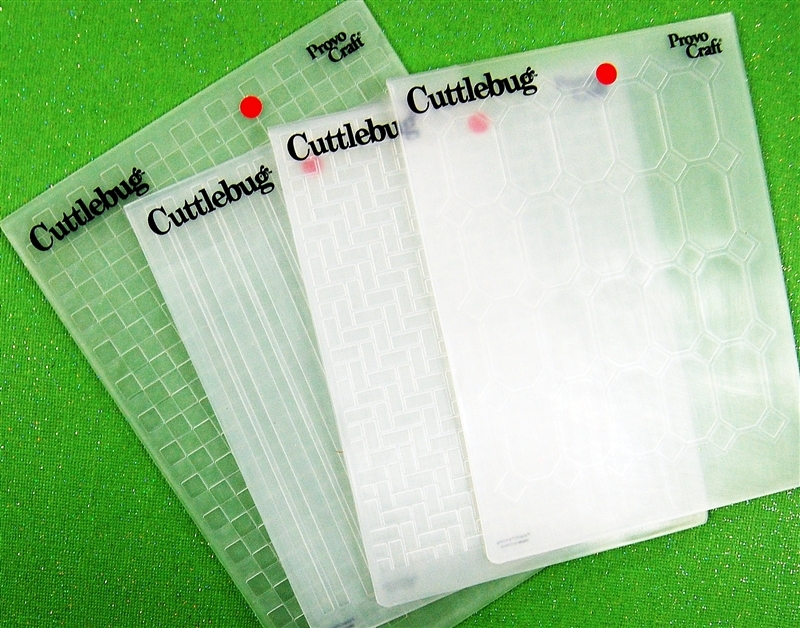 Cuttlebug and find many reasons to use it. To me it has a way of enhancing any card. Thanks for sharing. Lots of favorite tools -- but I couldn't exist without my Personal Trimmer and Corner rounder, two of the first things I purchased! 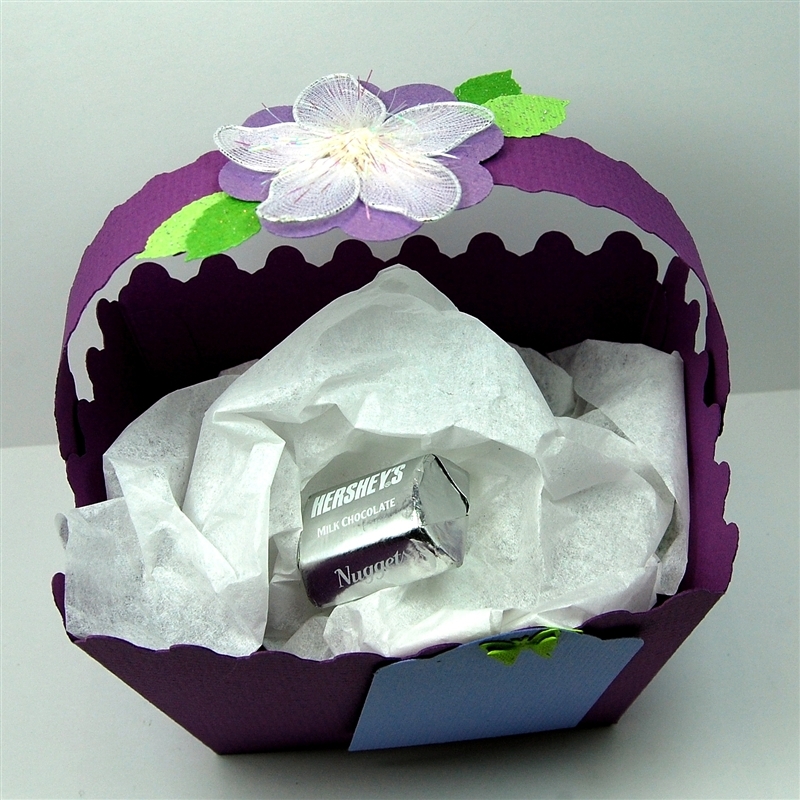 Love Art Noveau flowers but since I "borrowed" the cartridge from a friend, I'd love a pansy card kit! Love your photo with your TH Vagabond. Concord is a wonderful town! What a nice think for you to do. I love the basket and the Art Noveau flowers. I don't have this cartridge but it has loads of great things on it. I love the little butterfly touch on the tag. Thanks for all you do and you are an inspiration to all your bloggers. I don't get to post much anymore but I do read your blog when I can. Looks like a fun time was had by all! I wish I lived closer so there was a chance at experiencing your talents in person. Your blog is a must read for me every day--so I have to say that YOU are one of my favorite tools! The next favorite tool that I actually have in my possession is a screw drill punch, an "old school" item, but I find it works quite well and is easier for me to transport and use than the Cropadile. I can punch holes anywhere I want, through very thick materials. I thank you again for sharing your talents! I also use my cuttlebug more than any other tool in my scraproom. Little did I realize that when I bought it years ago. Yes, I want a Vagabond also -lol. Your site is my favorite for inspiration I can use right away! I've even tried some variations of incire cuts after seeing yours. I don't know how to post/send photos so you can see them (I don't have a blog). Anything that is embossed or pop-dotted is at the top of the list for me. Would have to say that my favorite tools are my punches. 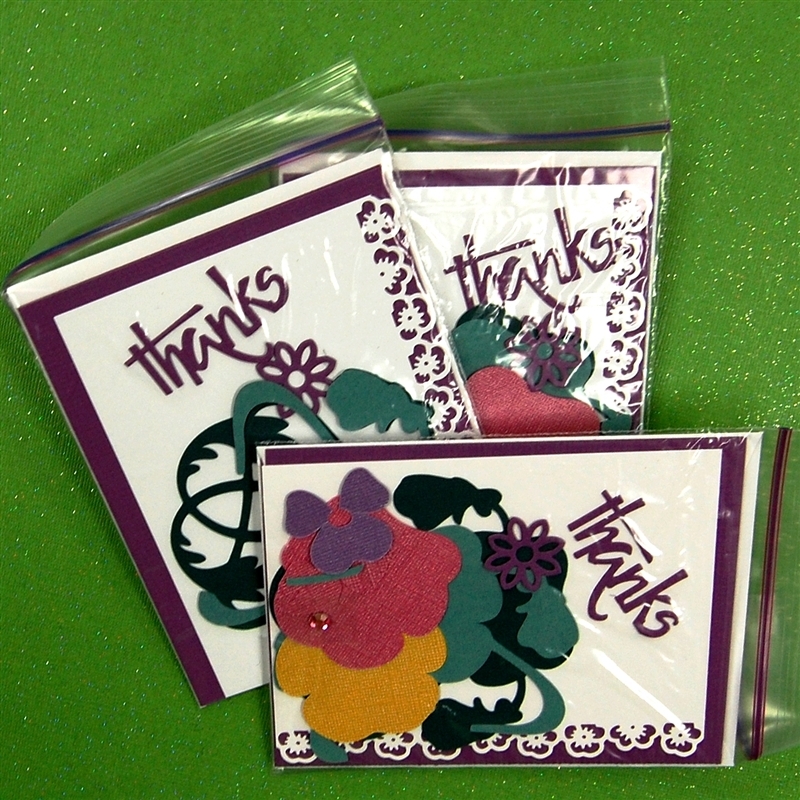 i can't seem to do anything without using my chalk inks and embossing folders. i also love my cameo. Favorite tool...it changes ALL the time. Right now I would say it's the Ephiphany Tool that helps make personalized baubles! It's so easy to personalize with a great finished look for scrapbooking or jewelery! Love your site....find myself every morning perusing your site over & over & checking back on old areas that had tips I search for constantly!!! Keep up the great work...I know it's a huge commitment everyday!!! From ALL of us -- THANK YOU! What a great little basket, and with your step by step instructions, it actually looks like something I can manage. I love the colors you chose.